For those who only know the calm beauty of the Rías Baixas, the Galician Rías Altas will be fascinating. Much narrower, more intricate and twisted than their southern cousins, the landscapes they have formed are totally different from those of the Ulla or Umia plains. Especially one of the rivers that form these Rías Altas, the Eume, fits and runs with ferocity between the slopes that contain it, making it difficult for centuries for human beings to pass and favouring the growth of a fabulous natural environment. At the gates of this forest is Santa María de Monfero, a Cistercian monastery that condenses in a few hundred square meters much of the history of such a fertile territory. Its façade is already a summary of the main materials of which the soil of Galicia is composed. Santa María de Monfero is unmistakable for the chequered pattern of the main portal, a baroque jewel of the 17th century. The ornamental effect was created by combining the blocks of pale granite that compose the rest of the building with others of black slate. Among the severity of the high Corinthian columns and the triangular pediments, the positive and negative squares seem a beautiful game for the visitor’s eye. This baroque façade acts as a curtain, covering the original church. The primitive, Romanesque of the 12th century, was replaced between the 16th and 17th centuries by the current building, a severe Baroque. It is a temple of great dimensions, in which the visitor’s gaze is attracted towards the stony ornamentation of the roofs around the monumental dome. Although most of what is seen comes from the period of splendor of the convent, the architects preserved several medieval tombs made of stone under which lie with the remains of several members of the family that dominated these lands during much of the Middle Ages: the Andrades, lords of Pontedeume, Vilalba and Ferrol. Their mark is still evident in various monuments of the area, such as the Gothic churches of Betanzos, the convent of San Agustín in Pontedeume or the great castle of Nogueirosa, also in Pontedeume. Nuno Freire de Andrade, Fernán Pérez de Andrade and Diego de Andrade, armed and guarded by fierce stone dogs, are buried in Monfero. The monastery was the center of power in the region for centuries, and its three cloisters serve as evidence of this. The Hospedería Cloister was built in a Renaissance style and has Romanesque remains; the Processional Cloister, from the same period, displays a beautiful baroque fountain in its center; and the Dormitory Cloister, designed in a late Baroque style, was never finished: while construction work was still being carried out, at the beginning of the 19th century, it was occupied by Napoleonic troops. The beautiful roofs of the “chirola” or sacristy, decorated with a hypnotic pattern of stars, faces, plants and geometric shapes, make viewers lose track of time. Santa María de Monfero is also one of the doors to the natural park of Fragas del Eume. Through the centuries, the river has dug a deep canyon, surrounded by the vegetation typical of atlantic forests, once abundant throughout Europe and nowadays reduced to protected areas like this one. 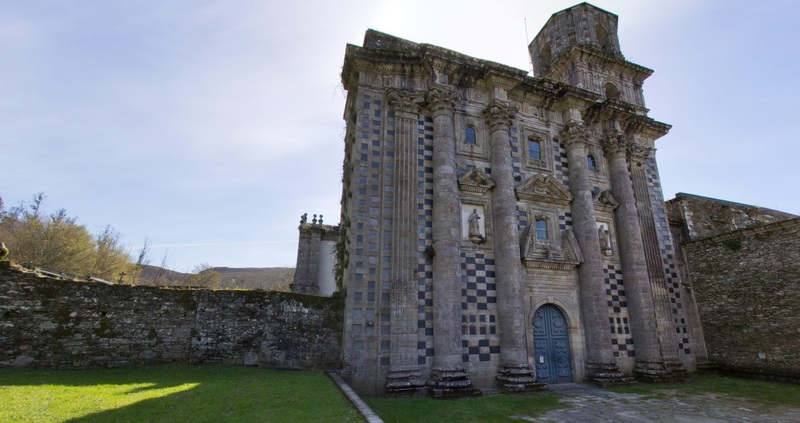 Both the monastery of Monfero and that of San Xoán de Caaveiro, on the other side of the river, show the attraction that this terrain, abrupt and difficult to access, has caused on human beings for millennia.